Hatchell and the women’s basketball program are also accused of overlooking and downplaying serious injuries in order to pressure players into continuing to compete through pain. 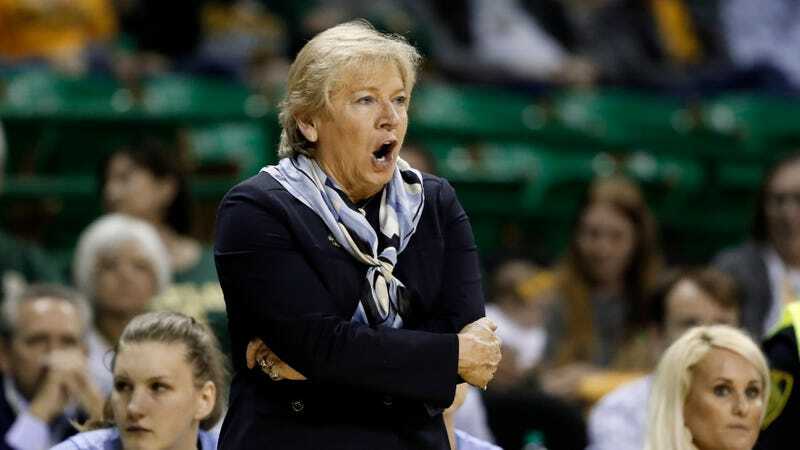 Hatchell and team physician Dr. Harry Stafford are accused of delaying an MRI on the injured shoulder of guard Emily Sullivan and then downplaying the injury’s severity for almost two years, in order to keep Sullivan on the court with the aid of cortisone shots. When Sullivan finally sought outside opinions, she learned not only that she’d suffered a torn labrum, but that the comprehensively crab-meated shoulder would require “complete reconstruction.” In another instance, Hatchell is accused of pressuring guard Stephanie Watts to play through knee pain in order to impress WNBA scouts; Watts also learned via an outside second opinion that her injury involved structural damage and would require a full break from basketball activities. This all reportedly came to light when a large group of parents held a meeting with UNC administrators late last week to discuss their concerns with the program. There’s plenty more in the Post’s report, which notes that four unnamed players have already filed paperwork to transfer out of Hatchell’s program, and another two are waiting to see the result of UNC’s investigation—and specifically whether Hatchell will keep her job— before deciding on their own futures.